Here at Geek Beat, our love of all things sci-fi is no secret. Who else do you know with a life-size Han Solo in Carbonite, or a transporter room? 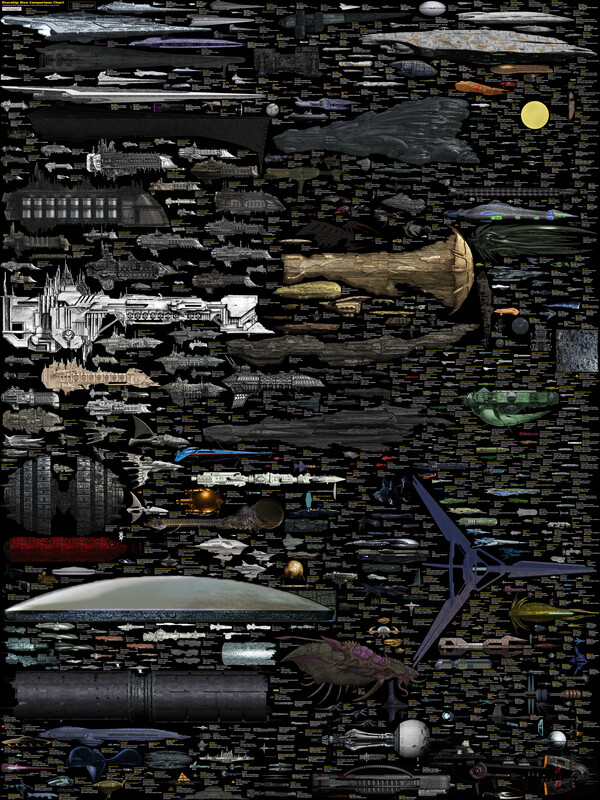 So when we heard about this truly epic sci-fi spaceship size comparison chart, we just had to share it! Put together by German artist Dirk Löchel, the huge 4268 x 5690 pixel graphic features ships from popular science fiction movies, TV shows and video games from the past 40+ years, including: Star Trek, Star Wars, Battlestar Galactica, Stargate, Doctor Who, Babylon 5, EVE online, Mass Effect, Halo and more. The first version was actually created a year ago, but having updated it with a ton of extra information, Löchel says the chart is now complete. For sake of image quality and organization, only spacecraft between 100 meters and 24000 metres are included – which is why the Death Star and a number of other large ships aren’t present. And sorry Whovians, as Löchel points out on his deviantART page, the TARDIS is both too big and too small to be included. To help provide a sense of real-world perspective, the diagram also features the International Space Station, which looks tiny in comparison to almost everything else. I’m going to go out on a limb and say that Serenity is not on there. The legend on the picture says 1 pixel = 10 meters, and Wikipedia lists her length at 82 meters, with a height of 23 meters. At this scale, a Firefly-class would be a smudge 2 pixels high and 8 pixels long. Absolutely loved it, am still looking for Serenity ( other vessels from the ‘verse are included, but not the original Firefly class … or, if she’s there, I haven’t yet found her !! ) and Blakes Seven.